It seems that every time Google releases a new version of their Quality Ratings Guidelines, a copy gets leaked. And yet, despite these ‘leaks’, the document continues to float around; even though it’s certainly within Google’s power to remove the documents from the web. From Google’s perspective, having the guidelines freely accessible to the public is probably not a bad thing: once you’ve read through the document, it’s quickly apparent that it won’t give unethical marketers an edge, or help anyone ‘game’ the system. The guidelines, which are intended as a resource for Google’s human quality raters, outline the process for evaluating a site in terms of quality: What makes a high quality site? How can you tell if a site is trustworthy? What types of sites need to be of particularly high quality? I’ll answer these questions and more below. But first, it’s important to briefly look at how human raters fit into the bigger picture of search, and how the quality guidelines can help the average business owner improve their rankings. 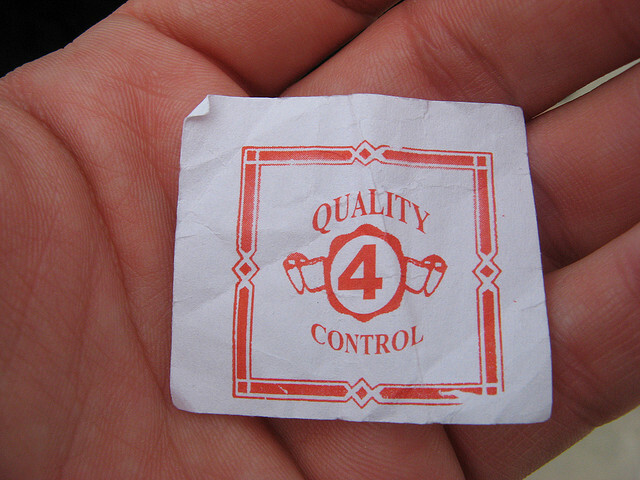 What are human quality raters? Some people have a misconception that human raters actually influence Google’s search results, however that isn’t the case. Rather, Google has human raters (several hundred of them) who function as part of their algorithm feedback loop. Here’s how it works: Based on a specific set of quality guidelines, human raters are responsible for assigning a quality score to a specific number of URLs. At the same time, Google’s engineers work – independently of this process – to change and improve their algorithms. As they make changes, they also monitor the rankings of the URLs that have been rated. Based on the feedback from the human raters, they are able to track how effective their algorithm changes have been. For instance, let’s say the rater has designated a site as ‘high quality’; however after an algorithm change, the site is still ranking poorly. This is an indication to the engineers that perhaps their algorithm needs to be tweaked or improved. So, the human raters actually have no input into whether a particular site ranks well or not; their feedback is simply used by Google to evaluate how effective their algorithm changes are. Why do we care about the leaked quality guidelines? Since the quality guidelines aren’t actually used to assign a ranking to individual sites, why do we care about them? To put it simply, they give us detailed insight into what Google considers a high quality site. While Google has provided us with general guidelines for building a Google-friendly site, the quality guidelines go into much more detail, and provide us with specific examples of quality content. Understanding what Google deems ‘high quality’ can have a significant impact on how we create and structure content, and on where we focus our SEO efforts. While they don’t offer any ground-breaking insights, they do provide us with more specific examples of what Google considers trustworthy and authoritative content. Following are 5 important insights to be gleaned from the handbook. Use these to evaluate your own content to ensure your site and individual pages are of the highest quality. 1.What is a high quality page? A satisfying amount of high quality MC [main content]. It also states that the site should have a sufficient or ‘satisfying’ amount of content on its About page, Contact page, Customer Service page, have valuable supplementary content, have a functional, user-friendly design and should be well cared for and maintained. A high quality site or page must have a high level of each of these three components. It is stated like this: “High quality pages and websites need enough expertise to be authoritative and trustworthy on their topic.” So the key here is making sure your content is written with a high degree of expertise. How does one ensure this is the case? The guide points out that different topics will require different levels of expertise. For instance, pages that can have a big impact on a person’s health and well being (these are known as YMYL – Your Money or Your Life pages), will require a higher degree of formal expertise. For instance, for a page containing medical advice, having a medical doctor write or vet the content would be preferable. For others topics (like sharing personal experiences), less formal expertise may be necessary. The handbook clearly differentiates between the main content (MC) of a page and the supplementary content (SC). Main content is defined as “any part of the page that directly helps the page achieve its purpose”. Basically, whatever the main purpose of the page – offering news, a useful tool, a blog post, etc. – the MC is the content that fulfills this purpose. The SC, on the other hand, provides other content that assists the MC in achieving its purpose. It improves the user experience of the page, but doesn’t actually help achieve the purpose. The guide points out that basically any content that isn’t MC or ads is SC. While the previous version of the handbook introduced the idea of YMYL pages, version 5.0 goes into more detail on the subject. It’s apparent that Google’s standard for these types of pages – ones which could potentially impact the health, wealth or happiness of users – are held to a higher standard. Financial information on topics like investing, banking, taxes, etc. Legal information like adoption, car safety info, etc. These types of pages will be held to the highest standard, so marketers need to put special focus on E-A-T for this type of content. While this newest version of the Quality Raters Guide doesn’t contain any game-changing information, it’s certainly helpful in terms of offering specific details and advice for creating the highest quality content. Ensuring your content is written by experts in your field, that you have a ‘satisfying’ amount of MC and SC, and that you provide the appropriate indicators that your site is trustworthy and authoritative will give you best chance of success. Click here to read the leaked handbook for yourself. Was there anything in the leaked guidelines that surprised you? What changes (if any) do you need to make to your site to ensure you have the highest quality content? Share below! Thank you for posting such a nice idea to us. you can visit us for more information about content quality at http://bit.ly/ZLuWYL .